After Baldur's Gate, Beamdog may tackle Black Isle's chilly dungeon crawler. I don't know what Beamdog's long-term business plan is, but I have a sneaking suspicion that it exists solely to target my wallet. The unassuming little company that's set out to bring Baldur's Gate to a whole new generation of gamers had a stranglehold on my funds as soon as it mentioned expanded content, and then sealed the deal with an irrefutable price. I guess securing $20 of my money isn't enough, though, because if Baldur's Gate: Enhanced Edition sells well, Beamdog intends to get right to work on an updated port of Icewind Dale, another Infinity Engine classic from the same era. "The topic of Icewind Dale has come up a number of times," tweets Trent Oster, president of Beamdog and member of the original Baldur's Gate dev team. "We are interested, but first we need [Baldur's Gate: Enhanced Edition] to succeed." Since the same engine powered Baldur's Gate and Icewind Dale the first time around, porting the second game would likely not be too difficult. However, rather than a straight-up port, Oster believes he could ease the conversion process by using the engine present in Baldur's Gate 2: Throne of Bhaal rather than Icewind Dale's original one, which was something of a bridge between Baldur's Gate and its sequel. "If we were to do Icewind Dale we would likely use ... all classes and kits in [Throne of Bhaal]." While Throne of Bhaal has tighter mechanics and an expanded class selection, using its engine would alter the Icewind Dale experience somewhat. 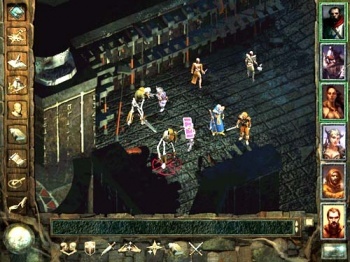 Whereas Baldur's Gate is a story- and character-driven game, Icewind Dale skews more towards dungeon crawling and party optimization (for starters, you get to create a whole party from scratch rather than recruiting predetermined NPCs). If anything, this may make it an even better match for the iPad than Baldur's Gate. Besides, if Baldur's Gate sells well, Beamdog can port Icewind Dale; if Icewind Dale sells well, than Beamdog can get to work on Baldur's Gate 3. This would mean another hit to my dwindling bank account, of course, but money spent on Infinity Engine classics is money well spent.